Sometimes I take one look at a piece of furniture and instantly know what needs to be done to it. I envision its end before I've even picked up a paint brush. This piece was calling out for a deeper, more stately shade, and Annie Sloan's Graphite is always my go to color when I want something to feel grounded. The drawers on this highboy dresser [a highboy is typically a dresser that's tall and has a wider base than its top...the more you know!] were in such great shape, they just needed some sanding along the edges to make them glide into the frame better. I removed the hardware so I could give the drawer fronts a good polish with a bit of Restore-a-finish [I only use this if wood needs a bit of brightening, not for any real staining work]. For the frame of the dresser, I painted it in two coats of Graphite, lightly sanding in between coats for a silky finish and doing a bit of distressing along the curves to highlight them a bit. I finished the surface with Annie Sloan's dark wax, which deepens the graphite. The warm tones of the wood complement the deep cool charcoal shade. This is easily my favorite combination. It instantly elevates any piece of furniture and makes it feel a bit more grand. I styled this vignette with a few things I'd picked up on my recent travels to Dallas. The Avett Brothers print is by an artist I met at the Deep Ellum Arts Festival [I can't seem to find his business card, but it's signed Jackson and I remember he's from Florida- I'll add him in if/when I find his information!]. I also grabbed a couple books from Goodwill, because of course I did. I got an old Kennedy biography and a Webster's Thesaurus [I absolutely LOVE a thesaurus!]. I then grabbed a few red toned pieces from my collection to round out the color grouping. When I'm not sure how to style something, keeping things fairly monochrome is the easiest way to pull things together. Also, tiny cacti never did anyone wrong, so in those went too. 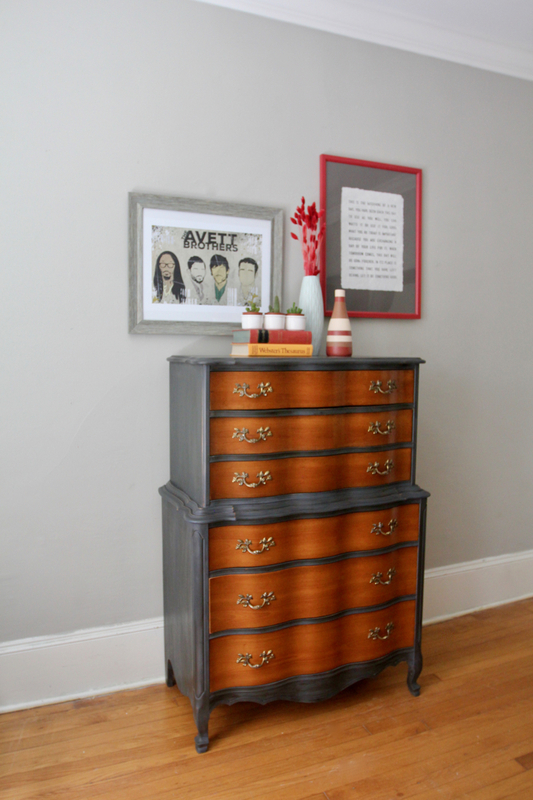 This highboy is actually the partner to the previous dresser I shared. It's incredible how color can transform the feel of a piece. Both of these are French Provincial in style, and yet the first one feels so feminine and light, while this one is much more masculine and weighted. I really do love how this piece turned out! 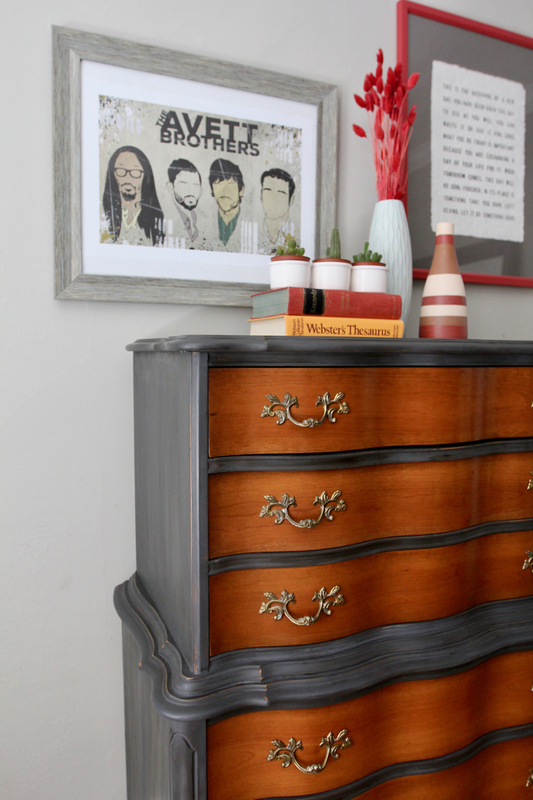 It's now posted for sale in my shop, and I can't wait to see where this beautiful dresser ends up!